E-pistle 2009/15 – What Is Sherried Whisky? The aim? To tease out what the sherry industry wants from oak, what the Scotch industry wants from oak, whether the two are talking about the same thing and, if not, what “sherry cask” actually means. It’s worthwhile having a look at sherry first. In very simple terms (this isn’t a piece on sherry… so it will skip over some technical details), sherry starts life as a simple dry white wine which then becomes one of the world’s most complex drinks. The style can be divided into two camps: the first uses biological aging to produce its character, the second uses oxidative aging. The first camp contains Fino and Amontillado. These are wines which are lightly fortified and then placed in butts of 500l – 700l and aged in solera. A blanket of yeast known as flor begins to grow naturally on the surface, looking like a thick woollen blanket. This protects the wine from oxidative effects, resulting in a wine which is pale in colour and light and fresh with no oak influence: fino. [Oloroso/Palo Cortado] are wines which have been initially fortified to a higher strength thus killing the flor. These wines are aged in solera and are in contact with air, making them darker, ‘nuttier’ and more concentrated. Palo Cortado starts life as an oloroso but then starts to exhibit aroma characteristics similar to an Amontillado. All of these are aged in butts of 500 – 700 litres in a solera system. The assumption, logically, is that the cask must have an influence on the wines. After all, that’s what we’ve been told by distillers. Fact is, sherry producers do not want any oak influence in their wines. The flavours are obtained predominantly by biological or oxidative aging. Solera butts therefore may be made from oak, but it’s tired oak. American oak was used because it coopered well. Spanish oak was considered to be of lower quality because it had higher levels of extractives and was more difficult to cooper. “The great wine shippers … esteem more than any [oak] that comes from the United States of America, next the northern oak, then the Italian and last the Spanish. American oak is generally very compact and not at all porous, so the wines do not leak; nor do even the most volatile and refined spirits filter through.” (Esteban Boutelou, 1805) So, if sherry casks for the sherry trade are close to inert, sherried whisky must be about the wine, right? After all what we mean by sherried whisky is all about raisins, Xmas cake, dried fruits, tannin, clove incense etc… some of the notes that were noted in the sherries. There is a different type of cask however. The whisky industry by and large didn’t use solera casks, but shipping casks. These were made from new American oak, first seasoned with must or wine. This was done “… because the oak contains tannin and other essential oils soluble in alcohol which can give taint to a wine. [even repair staves would be seasoned]. The seasoned cask was then rinsed and sulphured to destroy acetic germs.” (Gonzalez Gordon.) These were then filled with sherry and shipped. When they arrived in Scotland they were emptied and used for whisky. In other words, they were virtually fresh, made from new wood that had been briefly seasoned with sherry. Lots of extractives, lots of oak. The complete opposite of what the sherry industry wanted for its wines. The sulphury notes found in some ‘sherried’ whiskies are a result of the treatment of the shipping cask, or in more recent years treatment of the bespoke casks which the Scotch industry had to produce in order to maintain the ‘sherry’ element in its whiskies after sherry by law had to be bottled at source. 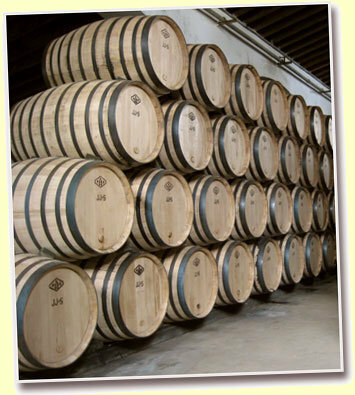 In these, European oak is preferred to American (though both are used); the casks are said to be seasoned with oloroso (but it is more likely to be “lesser wines”) for a period that can be anything from 6 months (standard) to 2 years. The casks are emptied and shipped to Scotland.. or Ireland. [IDL was a pioneer of the bespoke casks and works with Lustau. They season for longer, never sulphur their casks and only ship during the winter to stop any potential bacterial infection.] Also, the fact that sherry casks are toasted rather than charred means they are less effective at removing sulphury elements from new-make spirit. Double whammy. So, are these bespoke casks more about oak than sherry? Certainly q.robur has lots of colour extractivs, is high in tannins and contains compounds such as eugenol, (aka clove). So.. sherried whisky is in fact the oak talking? Not quite. The answer lies somewhere in the middle. The “sherry effect” that distillers want comes from European oak which has been modified by sherry. It is the way in which the sherry has interacted with the oak and then the pair interacting with the whisky which gives the desired effect. (As long as the cask has not been filled too many times that is…) Maturation involves subtracting unwanted elements (lost through evaporation, absorbed into charred layer, if there) adding extratives from the oak; and allowing comounds to interact. This last part is the most complex as it involves oxidative-driven processes creating new flavours as well as esterification in which the wine + oak produces elements such as acetic acid which then react with the spirit to produce esters. How do we know? Experiments have been tried. We know that an ’empty’ cask will contain between 5 (legally) and 10 (actual) litres of liquid within the wood. Adding 10 litres of sherry to a whisky dos not produce the same effect. Neither does aging whisky in ‘unseasoned’ European oak. It is the interaction with wood that’s the key. The oak has an infuence – but so does the wine.